The sturdy Crossrack of Kettler is a multi-functional training machine. 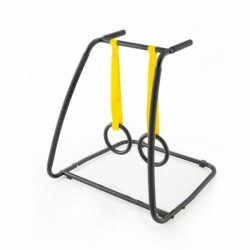 It offers versatile exercising possibilities for strength, coordination, and flexibility in a compact space. The range of execises includes more than 20 exercises (an exercise poster is included in delivery), for example, push-ups, crunches, balance exercises on the slackline, etc.. The diversified exercises can be done in three different positions and are very functional, balanced, encompassing and complex. The training with the Kettler Crossrack is characterised by the fact that all exercises only use your own body weight as resistance. Those who think that this training is not effective, are wrong. The training with your own body weight loads many muscle groups simultaneously and supports the interplay and the coordination of whole movement chains. In contrast to the training with weights and machines, it's not isolated training of muscle groups. Further advantages: the risk of injury is reduced, the risk of muscular dysbalances is minimised and an overload of tendons and joints is reduced as well. The training with the Kettler Crossrack and your own body weight is an absolutely effective training method to build and strengthen muscles. In addition, flexibility is increased, body control is improved, and functions of the cardio-vascular system are supported. Many exercises with the Kettler Crossrack can be varied and combined with each other. Due to its small size, the Kettler Crossrack can be space-efficiently stored away. Das Produkt Kettler Crossrack entspricht in jeder Hinsicht (Qualität, Übungsvielfalt etc.) meinen Erwartungen. Ein Kauf lohnt sich auf jeden Fall.